Paramount accessories: Furhter accessories can be found in our Software Bisque price list, this will also be listed bit by bit. Contact us and we will gladly create an individual offer for your desired device. Software Bisque offers to mount their new on axis encoders into ME II mounts. This cannot be done at the site. The ME II mount must return to Software Bisques new premises in USA. Prices quoted do not include return shipment cost for two ways transport,customs duty for the encoder value and labor cost as well as handling charges in USA. Please inquire for an offer if you are interested in this substantial upgrade. No stock products. Usual delivery time 4-6 weeks, depending on the order situation at Software Bisque. 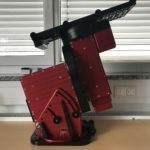 Please visit the Paramount ME II web page of Software Bisque for details about the Paramount ME II Robotic Telescope System. If you are interested, please send us an email to kontakt (at) baader-planetarium.com or call us. Applies to all mounts which are controlled by plug connections of hand controllers and / or by plug connections with electronic accessories. The plug-in connections at all contact points in astronomical telescopes are generally exposed to humidity and dirt. For the current transmission on such plug-in connections there is often a higher risk of danger due to humidity or corrosion as is ussually the with plug-in connections in the household. It is advisable to spray the connectors of all cable connections generously with contact spray and then plug in the respective plug several times. In this way, the contact is cleaned and at the same time corrosion and the accumulation of condensation water are prevented. Please do not spray into the socket! In this way, short circuits can be produced if contact liquid is used too generously and runs through electronic components inside the device. In any case, if there are undefined malfunctions during the electricity or signal transmission, it is first of all advisable to clean the plug-in connections by means of contact spray.